I could have been an Alexander (mum also went to Athens on the same trip) and, growing up in 1970s Britain, that always seemed a better bet to me. Alex I could have got away with. Julian was an unusual name, the sort of name that attracted attention. Julian was the soppy one in the Famous Five, and Andrew Lloyd-Webber’s equally soppy cello-playing brother. Julian was the sort of kid that any self-respecting Alexander would push around and rough up a bit. The only saving grace for a Julian at a tough school in Huddersfield was that fact that mum had at least decided against the nuclear option of calling me Julius. I doubt I’d be here today if that was my given name, though to be fair she tried her hardest to have me chased mercilessly by bullies on a daily basis by also handing out the unforgivable middle name of Piers. So, deep down, beneath the artificial layers of Jules and Yaw, I’m an authentic Julian. And my birthright is Rome, the Eternal City, where mum was seduced by power and glory, and where I went to find my forebear, my namesake, my all-conquering brother. And given how famous is Julius Caesar – his life and death 2,000 years ago still the stuff of history text books, even in Huddersfield – it’s remarkable how difficult it is to track him down in the city most associated with him. The quest starts simply enough, at the mighty bronze statue in front of the Forum (on Via dei Fori Imperiali). Here – in vigorous youth, at the height of his powers – is a man to be named after – Gaius Julius Caesar, of noble birth, descended from the Goddess Venus no less, victorious general in the Gallic wars, lover of Cleopatra, eloquent orator, master of Rome. Take that, schoolyard bullies! Julius Caesar was all those things and more – what he wasn’t, perhaps surprisingly, if you think you know the history, was an Emperor. Instead he was Consul and then self-declared Dictator of Rome in perpetuity – again, schoolyard bullies, you’re messing with a true-blood dictator, so I’d think twice about that wedgie. It all ended in tears of course on the notorious Ides of March in 44 BC, when senators Cassius and Brutus gave old Julius the ultimate wedgie – it was Caesar’s adopted heir, Octavian, who as Augustus later became the first Roman to be called Emperor. So the statue is easy to find, and across from it stand the remains of the Forum of Caesar, built with the spoils of the Gallic wars. But after that, the trail runs suddenly and surprisingly cold. Julius was born in Rome in 100 BC, in what was then a dodgy red-light district called Subara and is now the rather fancier neighbourhood of Monti. 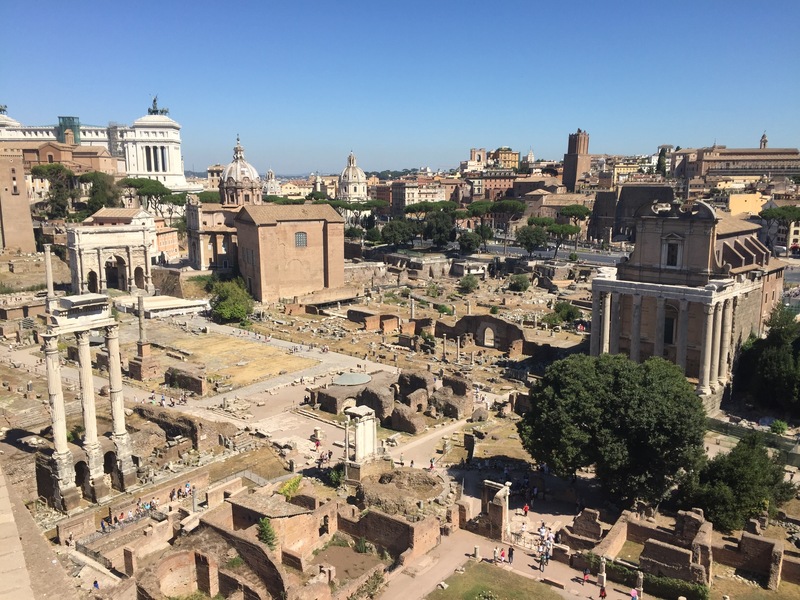 You’ll find no trace of him here though, while every single one of the most famous Roman sights – the Colisseum, the Pantheon, Trajan’s markets, the baths of Caracalla, the Circus – all date from after Julius Caesar’s rule. He undoubtedly walked the thoroughfares of the Forum, attended its temples, debated in the Senate and shaped some of its buildings – as did all Rome’s rulers – but there are only echoes and whispers of Julius in the remains you see today. An inscription here, a bust there – it’s a poor return for one of history’s most significant figures in the place he called home. If not in life, then in death. There’s one place in Rome where the ghost of Julius Caesar walks among frazzled commuters and puzzled tourists, in the large square called Largo de Torre Argentina, which doubles as one of the city’s principal bus termini. You’ll pass through on pretty much any cross-city bus journey, and curse if you have to change buses there because it’s hot, noisy and confusing. His body was later cremated, and a temple erected on the spot in the Forum – the remains can still be seen. But – desperately seeking Caesar – there’s little of Julius in Rome, and little of me I suspect in Julius, though a proud statue and a shudder on the back seat of a bus await each time I travel in my name-brother’s footsteps. Thank you! I enjoyed writing it too. I enjoyed reading this Jules, very entertaining!